We all know the benefits of Yoga. Everybody is aware about Yoga practice benefits but being a yoga teacher would be a superior feeling. In this article, I’m going to tell you that How you can become a Yoga Teacher. Being a Yoga teacher is not only about reaching the deeper roots of yoga or attaining proficiency — Yoga teacher training is a life-changing experience, a journey towards the inner satisfaction that make us aware of who we are, and what really makes us healthy and happy. True it is, in order to achieve a peaceful, healthy, and happy life, the process begins with an inward exploration, and yoga training is one sought-after way to do so. Learning on the birth land caters to the practitioner with authentic and traditional yoga teachings. Commence the majestic expedition of yoga teacher training and attain the most intensive benefits of yoga, its values, and spirituality from this divine land of origin. Many aspiring YOG is travel to the yogic land to undergo the YTTC, but all do not aim at having a flourishing yoga career. This is a misconception that it is for only for those who want to be a yoga teacher. This training is actually for polishing the self-practice skills and to direct the life towards health and positivity. This kind of training is more than merely a month-long program; it is a voyage from being a common man to becoming a YOGI and living a meaningful life. It also prepares us to face the challenges life throws and in the whole process, one can find themselves on the happier and healthier side. 1 How to Choose the Right Yoga School? Yoga is an ideal modus to set on the inward journey, one can delve deeper inside to attain self-awareness. Through self-awareness, one can know about their needs, body, and requirements in depth. The practice helps to have the better understanding of the Self, ignites the path to self-realization, and helps live in the present moment. A majority of qualitative programs offer Yoga Anatomy as a part of their curriculum and the subject helps a practitioner become aware of one’s body. Asana practice is of no use if a practitioner doesn’t know while practicing what is happening inside their body. With a proper knowledge and regular practice, have a sense of awareness, protect the body, prevent injuries and take a step towards a healthy life. As mentioned, how Anatomy being the major subject in the curriculum of training plays an important role towards having a safer practice and a healthier life. Likewise, other major subjects too, play an important role in leading a healthy and happy life. Yoga philosophy gives an in-depth knowledge of yoga ethics and morals. Once you start following these in daily life, you can feel the change. Knowledge about mantras helps to awaken the spirituality. Alignment and adjustment help to have a safer and injury-free practice, while Pranayama and Meditation take the yoga experiences to a whole new level. India (Bharat) is a mother land of YOGA Thus selecting the best Yoga Teacher Training in India helps attain the true yogic essence through practical and theoretical knowledge. Undergoing training in India, you come to know about a few major things that give out a sense of complete happiness and bliss. You start releasing that helping and supporting others can provide inner-peace and happiness. And being the source of inspiration and servitude only adds to this flame. When you plan to be a yoga teacher, you do not step forward just being yoga professional, but you help people to live better, healthier, and happier. Yes, yoga is not just for oneself, but with it, you can also help others to follow the right path. During the training, you will learn how to conduct a class and when you become an expert pledge to spread the yogic wisdom to all the needy, and encourage people to choose the path of yoga. Whether you want to be a full-time teacher or want to open up your own studio, the passion of serving others and wanting them to be on the right path emerges genuinely. Being an avid practitioner or just a beginner on the yoga mat, yoga training is for every yoga lover. The phase makes you experience the change you attain in your life, in your body and intellect. You will realize how gradually you transform into a better person and start living the life of a Yogi. Undergoing the training, you start following certain lifestyle practices and gradually adopt the same in your daily life. Yoga is a wider concept and is not just about practicing Asanas. The Yoga ethics comprising of Yamas and Niyamas help reach the goal of enlightenment. Yamas and Niyamas are the yoga morals, ethics, and principles that not only help us throughout the yogic journey but also help us in leading a well-defined life. How to Choose the Right Yoga School? Yoga Alliance Affiliated School- Make sure that the school you choose is Yoga Alliance certified. Yoga Alliance is an international body that promotes the best practices of yoga across the globe and a Yoga Alliance certified school and center ensure the best teaching of yoga to the participants. Know About the Teachers- Yoga teachers and trainers play a vital role in shaping the yoga practice and provide an in-depth knowledge of yoga. A great teacher is the biggest asset to the school and they should be qualified and experienced. Holding a Yoga Alliance certification is definitely a bonus. Curriculum- Wishing a Yoga Alliance Affiliated School offers curriculum as per the globally-recognized standard of the Yoga Alliance. The ideal curriculum includes the teaching of major subjects like- Yoga Philosophy, Anatomy, Asana, Pranayama, Meditation, Adjustment and Alignment, Mantra, Ayurveda, and many more. Exotic Location- Travelling and being in a new place impact our lives in many ways. It helps us in keeping the mind and body healthy, creates inner-happiness, and provides peace to the soul. Visit the birth land of yoga and commence the yogic journey in India. 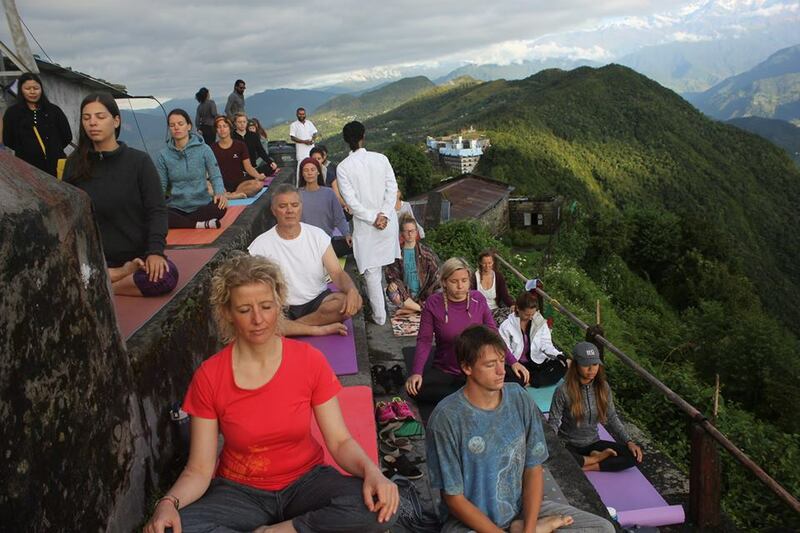 Rishikesh is the best location to get training for Yoga. Other Things- An ideal training program is all-inclusive- food, accommodation, study material, and excursions. Make sure the school provides a comfy accommodation, nutritious Ayurvedic food, and excursions at popular places and heritage sites to gain the practical knowledge. Apart from it, Indian government officially celebrate Yoga Days to spread awareness about Yogi Culture. You can read about Why we celebrate Yoga days at here. This is for every Yoga enthusiast who truly wants to change their lives for the betterment. Commence the tranquilizing journey of this holistic art to realize it for real. Never forget to Visit India for Yoga Training if you live outside of India.